Books dealing on Scottish history were easier for me to obtain than those dealing with Irish history, so in my childhood I knew infinitely more about Scottish history and legendry than Irish. I had a distinct Scottish patriotism, and liked nothing better than reading about the Scotch and English wars. I enacted these wars in my games and galloped full tilt through the mesquite on a bare-backed racing mare, hewing right and left with a Mexican machete and slicing off cactus pears which I pretended were the heads of English knights. Robert E. Howard's Irish fascination is well-known and explored among Howard scholars. Nearly every genre and series he wrote had some connection to Ireland and the Irish: several series starred Irishmen in lead roles, and a few of his most famous stories are set in Ireland. But Ireland is not the only Celtic nation Howard wrote about: Scotland too can boast her share of Howardian heroes and histories. Howard was far from alone in setting his Weird Tales in Scotland: Edmond Hamilton's "The Atomic Conquerors" is a wild yarn which supposes a rather otherworldly origin for the mysterious vitrified forts populating the Scottish wilderness; H. Warner Munn's "The Werewolf's Daughter" is a grand trilogy detailing the adventures of the Werewolf of Ponkert; Weird Tales regular Seabury Quinn even got in on the action with "the Bride of Dewer," a Rumpelstiltskin tale with a tartan twist. So, on Robert E. Howard's 113th birthday, I wonder: what would a "Scottish" anthology of Robert E. Howard stories look like? I don't know if Howard ever read Jane Porter's The Scottish Chiefs, or saw the 1921 edition with N.C. Wyeth's glorious illustrations. It'd be really cool if he did, though. Well, Bran Mak Morn is a given. Bran is pre-eminent among Howard's Scottish heroes - indeed, among all his heroes - immortalised in several stories published in Weird Tales. There's little I can contribute that has not already been explored by dozens of Howard scholars over the decades, but I can offer a brief overview. The main Pictish tales are collected in Del Rey's Bran Mak Morn: The Last King, along with several fragments and synopses, and superlative analysis by Howard scholars Rusty Burke & Patrice Louinet. There are also the non-Bran stories featuring Picts: the Cormac Mac Art adventures "Tigers of the Sea" and "Night of the Wolf" feature Picts, and the former also has one Eochaidh of Dalriada - another of the Kingdoms which would become Scotland. "The Ballad of King Geraint" is a truly epic poem with a full cast of characters, including Angus the Scot, Donal of Strathclyde, and Dulborn the Pict. 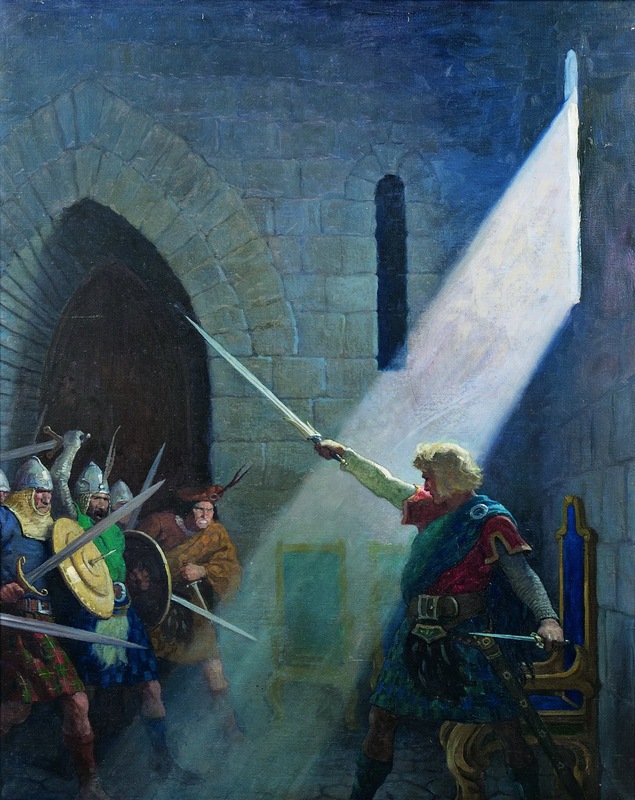 Although most of Howard's Scottish - more properly, Caledonian - tales are mostly from the very edge of Antiquity, there are some significant adventures from the Middle Ages. Perhaps the most significant of these is the Highland avenger Donald Mac Deesa, Timur's Bane, in the grim and moody "Lord of Samarcand." An interesting counterpart can be found in Giles Hobson, (possibly) the son of a Scottish Border baron, in the humourous "Gates of Empire." Dark Agnes, my very favourite Howard character, gains a dashing Scots ally in "Mistress of Death"'s John Stewart. "A Song of the Race"
"The Ballad of King Geraint"
"The Deed Beyond The Deed"
Sound good? For the completionist (i.e. me), one could include bits and pieces like the Bran synopses, the tantalising Angus Gordon fragment, and "The West Tower." While there's a small industry in Howard collections these days, sometimes I think it's nice to put stories together by these sorts of themes. Certainly you could class most of these in a larger "Celtic" collection that includes Irish, Brythonic, and Gaulish heroes. But as a Scot, I think it's only fair to highlight one of my favourite authors' meditations on the country of my birth, which continues to mean so much to me. Over a century and half a world away, somehow Robert E. Howard shrinks that distance to a few footsteps through the power of his words.